The hippies….ahem, I mean CLAY PIGEONS have been launched, now FIRE! Talk about a shotgun wedding. Mmmm. I love the smell of cordite at a reception. Figured the minority guy would be in front of them, not behind. I am not a republican (not even close) and I wouldn’t mind playing with guns (and motorcycles) on my wedding day. 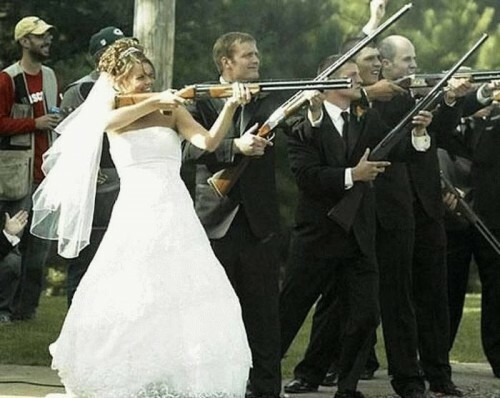 I’d say this is more of a redneck wedding than a republican one. You ignorant biased assholes probably think all republicans are rednecks, which is not true. Me for example. And while like any REAL man, I love playing with guns, this is kinda silly. This can’t be a redneck wedding. The bride is hot. Hey is that Sarah Palin? Personally, she looks like Jennifer Morrison to me. If it were a black wedding those would be handguns,right?